Arrows should generally follow the manufacturer’s suggested sizing for the bow and poundage an archer is shooting. There are no course rules limiting the arrows used. Archery golfers typically select arrows based on distance from the ball they are shooting. 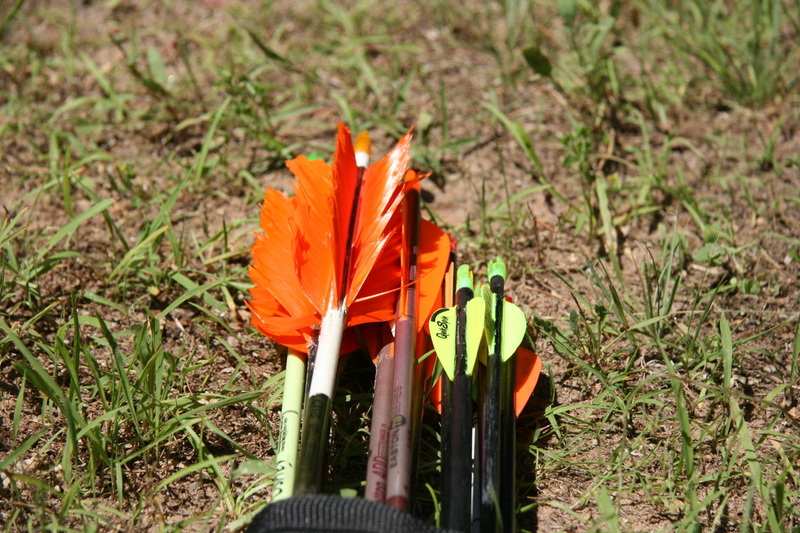 One experienced archery golfer stated, "For most of the tee off shots I use a 1916 arrow and for long fairway shots I like to use a 1716 arrow which is physically lighter.” This archer’s draw length is 29 inches and shoots a 46-pound recurve bow.” For extended yardage shots, like the 9th Hole at 350 yards, archery golfers will often experiment with shooting lighter weight arrows with smaller vanes to extend the distance the arrow will fly. For close shots at the ball or “pick-offs,” digger points or “diggers” are strongly encouraged. A digger is a field or blunt point with a spike drilled and soldered into the end. The digger points are used to help the arrow stick into the ground without skipping-out and landing beyond the spot it originally hit the ground. Two example diggers are shown the picture below. The diggers sold by the club range from 80 grains to 150 grains. A variety of sights are used for archery golf. These sights range from a standard hunting sight to a dual-mirrored sight used to compensate for varying yards while placing the sight cross-hairs on the ball. Other archery golfers use a variety of arrow-hold points to change the elevation of the arrow released so they can use a standard sight for long distance targets. 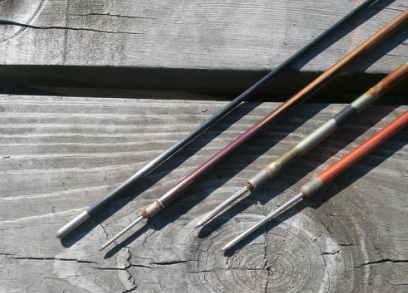 Most methods are acceptable, from multiple peeps, to markings on your bow, to tubes filled with colored water that will give you the right elevation for the arrow flight. NOTE: Traditional archers may not use sights or sight markings on their bows during competition. The bows used for archery golf can be of any type; except crossbows. The technical specification for a bow is not limited and a bow can be of any weight or let-off. BOW RULE 1: Once the bow has been setup at the start of a competition, the bow-weight can't be adjusted or changed during that competition. BOW RULE 2: Crossbows are not allowed on the archery golf course. The traditional archer relies solely on instinctive shooting for competition. For this reason, Traditional Archers must use a bow without any mechanical devices other than the bow, arrows and a leather tab or glove for releasing the bow string. 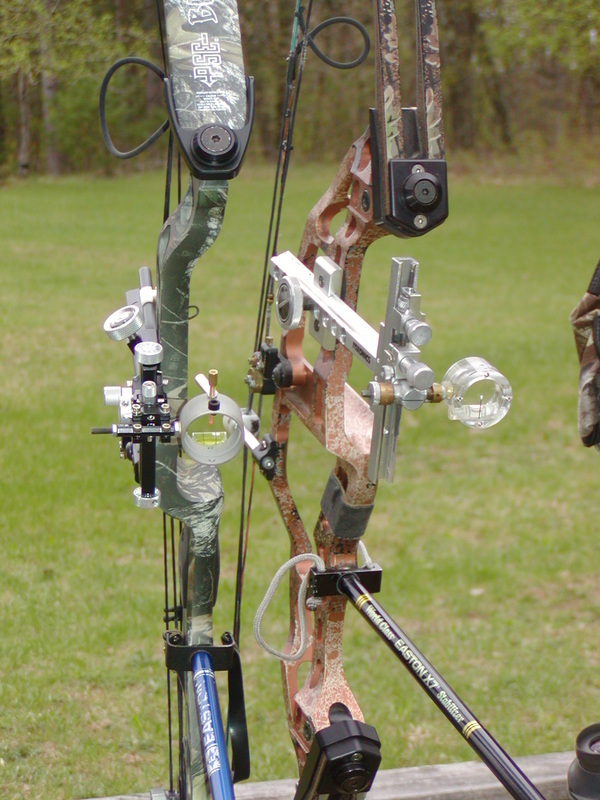 Devices like sights, elevation indicators, mechanical releases, levels, or compound bows are not allowed for traditional competition. We have a limited number and type of bows for you to use as well as quivers and arrows.